US, 2004, 120 minutes, Colour. Jackie Chan, Steve Coogan, Cecile ance, Jim Broadbent, Ian Mc Neice, Adam Godley, Ewan Bremner, Richard Branson, Macy Grey, Arnold Schwarzenegger, Maggie Q, Summo Jung Kam- Bo, Rob Schneider, Luke Wilson, Owen Wilson, Mark Addy, John Cleese, Will Forte, Kathy Bates. Better to sight one’s sights rather lower for this pantomime version of Jules Verne’s classic novel. 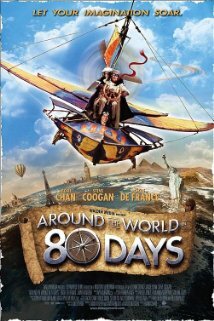 It has been co-produced by Jackie Chan who takes on the role of Passepartout (ensuring that one of the major stops on the way is in a Chinese village), the roguish hero who accompanies the rather uptight Phileas Fogg on his epic journey. British comedian Steve Coogan is Fogg and plays him ultra-seriously. It is left to Chan to offer the lighter touch (and some martial arts acrobatics). Cecile de France is the artist who adds glamour to the proceedings. The film is amusing but often rather silly for adults. The slapstick (plenty of it) is for the younger audiences. It also evades many of the difficulties of how Fogg and co actually got around the world so quickly when they seem to have been bogged down in Turkey or India or China and then, with little or no explanation have reached their next destination. Fogg has invented some eccentric machines which offers some fascination, especially building the flying machine from the transatlantic steamer after advice from the Wright Brothers (a funny cameo from Owen and Luke Wilson as Orville and Wilbur cycling through the desert). There is also a subplot where the entertainingly dastardly Lord Kelvin (Jim Broadbent giving it the right touch of exaggerated villainy) employs a female Chinese general to pursue Passepartout who has taken back from the Bank of England a jade Buddha stolen from his village. Part of the entertainment for the adults is the range of guest appearances, including a glimpse of Richard Branson with a hot air balloon, Arnold Schwarzenegger sending himself up as a Turkish potentate, Rob Schneider as a smelly San Francisco homeless man and Kathy Bates as Queen Victoria.